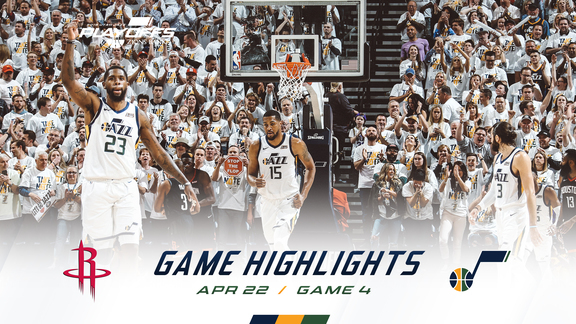 After a back-and-forth first half full of runs by both teams—11-2 and 7-0 for Utah, 10-0 and 18-3 for Houston—the wheels fell of for the Jazz in the second half of a 125-98 loss Saturday night in Salt Lake City. 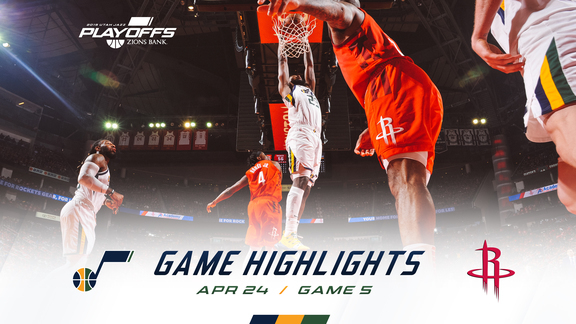 The Jazz (30-24) and Rockets (30-22) split the season series two games apiece. There were five ties and 11 lead changes in the first half, but Utah was doomed by ice-cold shooting (36.0 percent as a team) and a game full of tough calls (and no calls) that sent reigning league MVP James Harden to the free-throw line 15 times—all in the first three quarters. "It's hard not to foul him," Jazz coach Quin Snyder said. "He's very difficult to guard. To be as aggressive as he is right now and also to be so efficient and poised—he's playing at a level that's rare." Donovan Mitchell led the Jazz with 26 points, while Rudy Gobert logged his 43rd double-double of the season with 10 points and 13 rebounds. Jae Crowder, who started against Houston's small-ball lineup, added 11 points, five rebounds and four steals. Joe Ingles (11 points) and Royce O'Neale (10 points) also scored in double figures for the Jazz. Harden lit it up with 43 points, 12 rebounds, five assists, six steals and four blocks in 40 minutes. He shot 12-for-22 from the field and made all of his previously mentioned free-throw attempts. Harden now has 19 40-point games this season. Gerald Green scored 25 points and shot 7-for-12 from 3-point range off the bench for the Rockets, while Kenneth Faried finished with 16 points and 12 rebounds in 20 minutes before fouling out in the fourth quarter. Mitchell shook off a slow start (1-for-9 shooting) to score 18 of his team-high 26 points in the second half. Mitchell added six rebounds, nine assists and a steal, and he's now scored at least 22 points in 14 of his last 15 games. Utah shot 10-for-20 to start the game, but only 21-for-66 (31.8 percent) from that point on. The Jazz committed 23 turnovers, which led to 25 Houston points. Harden has now scored at least 30 points in 26 straight games, the third-longest streak in NBA history. Wilt Chamberlain has the two longest streaks (65 and 31 games). "We needed to be more determined. Be stronger with the ball. Just play with more force. I thought they were dictating, and we were on our heels a bit offensively." Derrick Favors blocked a season-high five shots. ... The Jazz played without Danté Exum (ankle), Raul Neto (groin) and Thabo Sefolosha (hamstring). ... Chris Paul (rest) and Clint Capela (thumb) were out for the Rockets. ... Houston shot 15-for-39 from 3-point range. Utah shot 11-for-41. ... The game featured 50 fouls—21 on Utah and 29 on Houston. ... Utah outscored Houston 19-0 in transition. ... The Rockets outscored the Jazz in each of the four quarters. ... Gobert and O'Neale picked up technical fouls, as did Houston's Eric Gordon and Austin Rivers. The Jazz will stay at home to face the Phoenix Suns on Wednesday night. Tipoff is set for 7:00pm MT.